Yes, yes, I know, I’m late with this update. You expected it yesterday, as usual, but I have a good reason. Today we landed some new sparkling features, so now you can test them :-) As usual, please report any bug you find on Launchpad, so we can fix them! I described it when I presented you the design of the Calculator Reboot, and now it’s time to see it in action! 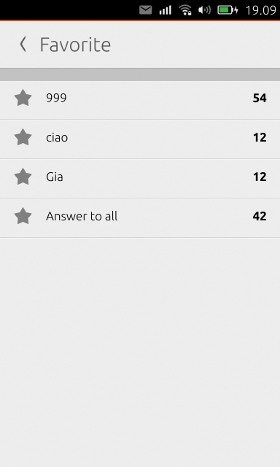 With favorite feature you can save your old calcs, to have a history with things you have to remember. Plus, it is implemented in the bottom edge page; who has an Ubuntu Phone knows what I’m talking about. It’s a very cool gesture you can find in action there. This is an idea by Daniel Wood who commented last week post on G+. See? It’s important to leave us feedbacks, we try to implement them as soon as possible! So, now, when you click on equals the calculator closes all brackets you left open. So no more errors when you forgot to close a bracket, we fix it for you. Thanks to Giulio we now could swype a calc from right to left to copy it - it isn’t necessary anymore to long click on it. 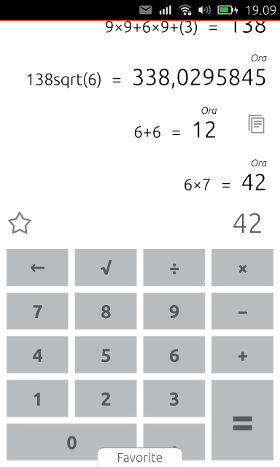 Thanks to Ubuntu community the calculator now it’s available in a lot of languages. Wow, I asked help for translations only one week ago and we already have the app completely translated in 15 languages (and a lot of other languages has a good portion of strings already translated). If you don’t have the app in your language, take a look to our translation page! Thanks to Giulio we have a better view in portrait mode: he changed proportions, so now on krillin you can see also the last calc you did, and not only the current one. #74 Launchpad automatic translations update. #77 Launchpad automatic translations update. #78 Launchpad automatic translations update. #83 Launchpad automatic translations update.